In 1953, the year Port Canaveral was dedicated, a Special Act of the Florida state legislature created the independent governmental agency that operates the port — the Canaveral Port Authority. The Board of Commissioners holds regularly scheduled meetings on the third Wednesday of each month unless otherwise posted. Meetings are held in the Port Authority Commission Room at Port Canaveral and are open to the public. Port Canaveral is experienced in handling bulk, breakbulk, refrigerated, project, container and Ro/Ro cargoes. It is closer to more major Florida markets than any other port, and also offers services to the southeastern United States, Caribbean, Central America, South America, Europe, Canada, Africa and Asia. Port Canaveral boasts efficient transportation links by road, rail, sea and air — including non-stop direct highway access to Orlando. There is direct access to the Atlantic Ocean, only 45 minutes from the first buoy to dock. There is deep water at Port Canaveral’s entrance channel (44 feet or 13.4 metres) and berths (40 feet to 35 feet or 12.1 to 10.6 metres). There port also offers open, covered, specialized and cold/chill/freezer dockside warehousing facilities. Port Canaveral is in Foreign Trade Zone 136. There are independent inspection and government services on site and available 24/7. Continuous investment in infrastructure upgrades — piers, channel, roadways, etc. — help the port to retain a competitive edge. Further advantages include low pilotage rates, union and non-union stevedoring, available capacity and a motivated, service-oriented cargo team. In March, Canaveral Port Authority Commissioners approved a new ten-year marine terminal operating and lease agreement with Morton Salt that paves the way to expansion of the company’s operations at Port Canaveral. The current agreement expires in 2014. 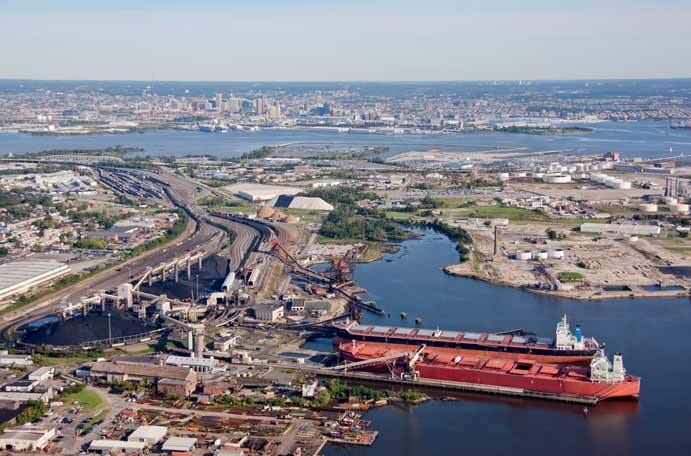 Terms of the new agreement are estimated to generate $13 million in revenue for the Port and allow Morton Salt to expand operations and their footprint at the port. The company is expected build a new distribution warehouse, which could to lead to job expansion and new product lines. Currently, the company employs 54 Brevard County residents. Morton Salt currently imports its salt to the United States and returns with exports to Great Inagua. The East Coast of the United States is the main dry bulk commodity exporter through the Panama Canal, with an average of 48.5% of the dry bulk cargo per fiscal year, followed by Asia and the West Coast of South America with an average of 11.3% and 11.2% respectively. Panama Canal. Its participation is between 40% to 45% among all cargo that uses the waterway. In the last five years, an average of 93 million metric tonnes of cargo has transited through the Canal. There is an average of 3,053 transits per year, and more than 50% of these are Panamax-sized dry bulkers, with beams between 100 to 106 feet. Grains are the main dry bulk cargo commodity with a share of 40% of the dry bulk cargo. This is also important for the Canal because grains generate large amount of ballast vessels annually. Other important commodities are coal and coke, ores and metals, minerals and nitrates, phosphates and potash that represent an average of 14%, 13%, 7% and 6% respectively of all dry bulk cargo. During the first nine months of the current fiscal year, the Panama Canal has registered a record of grain cargoes — a total of 39.2mt of grains was transported through the waterway, the highest level recorded since 2011. The Panama Canal is approximately 80km long between the Atlantic and Pacific Oceans. This waterway was cut through one of narrowest saddles of the isthmus that joins North and South America. The Canal uses a system of locks — compartments with entrance and exit gates. The locks function as water lifts: they raise ships from sea level (the Pacific or the Atlantic) to the level of Gatun Lake (26 metres above sea level); ships then sail the channel through the Continental Divide. The lock chambers — steps — are 33.53 metres wide by 304.8 metres long. The maximum dimensions of ships that can transit the Canal are: 32.3 metres in beam; draught 12 metres in tropical fresh water; and 294.3 metres long (depending on the type of ship). The narrowest portion of the Canal is Culebra Cut, which extends from the north end of Pedro Miguel Locks to the south edge of Gatun Lake at Gamboa. This segment, approximately 13.7km long, is carved through the rock and shale of the Continental Divide. Ships from all parts of the world transit daily through the Panama Canal. Some 13,000 to 14,000 vessels use the Canal every year. The Panama Canal serves more than 144 maritime routes connecting 160 countries and reaching some 1,700 ports in the world. The Canal has a work force of approximately 10,000 employees and operates 24 hours a day, 365 days a year, providing transit service to vessels of all nations without discrimination. The expansion of the Panama Canal will allow transits of dry bulk vessels of up to 185,000 deadweight tonnes with up to 140,000 tonnes of cargo. With the expanded Panama Canal, an additional 16% of the number of vessels and 34.8% of deadweight tonne capacity of the existing drybulk world fleet will be able to transit the Panama Canal when the new locks begin operation in January 2016. In summary, 96.6% of the number of vessels and 87.2% of the existing deadweight capacity of the dry bulk fleet will be able to transit the expanded Panama Canal. The Panama Canal Expansion is the largest project at the Canal since its original construction. The project will create a new lane of traffic along the Canal through the construction of a new set of locks, doubling capacity and allowing more traffic. The existing locks allow the passage of vessels that can carry up to 5,000 TEUs. After the expansion the Post-Panamax vessels will be able to transit through the Canal, with up to 13,000 TEUs. The Expansion will double the Canal’s capacity, having a direct impact on economies of scale and international maritime trade. In a major step forward for the Panama Canal Expansion Program, the second shipment of four rolling gates for the third set of locks arrived on 12 June from port of Trieste, Italy to the waterway’s Atlantic side on board the semi-submersible heavy lift vessel Sun Rise. “This is another milestone as it completes half of the 16 gates that will be used in the new locks,” said the administrator of the Panama Canal Authority, Jorge Luis Quijano. Following a nearly one-month-long journey, the ship completed its second trip that began in mid-May in the Port of Trieste, crossing the Mediterranean Sea and the Atlantic Ocean. Differing from the first shipment, these gates have two different dimensions, according to their final position in the lock chambers. The taller ones or ‘Type C’ were fabricated for lock head number 3 in the middle chamber of the Pacific locks. They are 57.6 metres long by 10 metres thick and 31.9 metres tall and weigh approximately 3,900 tonnes, with all internal appurtenances installed. The shorter ones or ‘Type A’ will be located in lock head 1 in the Atlantic site’s upper chamber, adjacent to the lake. They are 57.6 metres long by 8 metres thick and 22.3 metres tall, and weigh approximately 2,300 tonnes. The four rolling gates will be disembarked in the dock especially built for this purpose on the Atlantic side. While the two gates destined for the Atlantic complex will remain in the staging area until the time of their installation, the other two will be transferred to the Pacific site once the installation of the concrete supports are completed in the dock built for their unloading. Gate fabrication, which started in October 2011, is being performed by Italian subcontractor Cimolai SpA. The new locks will operate with a redundant rolling gate system, with a total of 8 gates in each locks complex. The first shipment of rolling gates arrived in Panama on August 20, 2013. The third shipment, with two Type C and two Type F rolling gates is scheduled to arrive in Canal waters in October of this year. Grupo Unidos por el Canal is the contractor responsible for the design and construction of the third set of locks. Following an agreement signed between the contractor and the Panama Canal Authority, all rolling gates must be in Panama by February 2015. A total of 76.3% progress has been achieved under the Canal Expansion Program as of May 31, 2014. CSX Corporation, together with its subsidiaries based in Jacksonville, Fla., is one of the USA’s leading transportation suppliers. The company’s rail and intermodal businesses provide rail-based transportation services including traditional rail service and the transport of intermodal containers and trailers. Overall, the CSX Transportation network encompasses about 21,000 route miles of track in 23 states, the District of Columbia and the Canadian provinces of Ontario and Quebec. Its transportation network serves some of the largest population centres in the nation. Nearly two-thirds of Americans live within CSX’s service territory. CSX offers customized, rail-centric solutions that connect its customers to more than 70 ocean, lake and river ports via the largest rail network in the eastern United States. Its international sales and marketing team has strong partnerships throughout the shipping industry, including with stevedores, warehouses, container transloading companies and third-party logistics services. CSX also offers in-house solutions such as regional development to help locate new industries on our railroad, and partners with short-line railroads and transloading services to offer the advantages of shipping by rail, even for customers that are not rail-served. CSX is committed to meeting its customers’ international shipping needs today and in the future. It is investing more than $1 billion annually on its rail network to increase capacity, efficiency and reliability. In addition to giving port customers more transportation options, rail reduces congestion at ports and on highways, and offers environmental benefits such as minimized carbon emissions. managed train loading to match laycans. The Curtis Bay Coal Piers are equipped with the latest equipment, including three dumpers that provide for great flexibility and throughput capacity. CSX continues to invest in the equipment and facilities at the piers, and in the past four years, expenditure has amounted to over $50m. Improvements include the addition of two 160-car indexers, and the reconfiguration of the receiving yard to land three 130-car trains. More coal storage has also been added to support more export volume. The first coal to be handled on the new pad was on 27 August last year. CSX has the ability to expand its ground storage if the markets dictates. redecked B&O pier in 2014. CSX is in a unique position to manage loadings to vessel laycan*. Terminal agreements provide flexibility to the customer and CSX. CSX can maximize storage capacity by managing cargo accumulation, and match train loadings to laycans. Its direct dump capability includes partial cargo accumulation and fleet loaded trains to meet vessel and fill out cargo. It also offers co-ordinated train and pier operations, with a dedicated train coordinator, sufficient train staging and loading capacity and all- new high capacity aluminium cars in service.